Well here we are at Part II of our Lowell Observatory adventure and day 2 of the AAVSO annual meeting. Again I will report on just two topics that were of special interest to me. There were many interesting technical presentations but I will not review them. 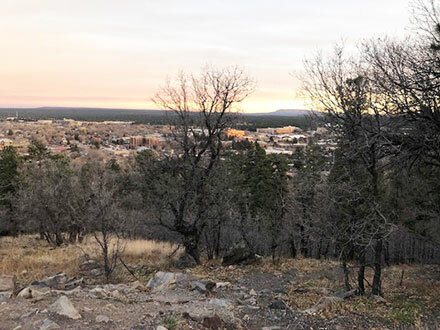 Also, Resident Astronomer Peggy found most of the presentations too technical and decided to just explore some of the downtown Flagstaff attractions. 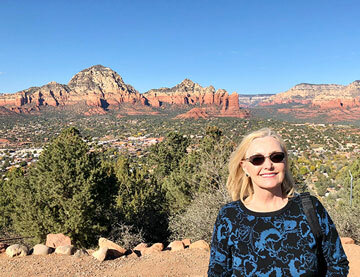 I also decided to play hooky form a couple of sessions so that we could drive around and explore the area including the Wupatki National Monument and Sunset volcanic crater and the exciting arts community of Sedona, AZ. One technical session that particularly interesting was by Richard Berry who also tried to repeat the famous experiment of measuring the bending of light by the sun as observed during an eclipse. He went into many of the technical details that make performing this experiment very difficult. In his case his telescope setup was on the eclipse line so he did not have to move or change the setup to capture the eclipse images as well as the background star positions, without the sun present, 6 months earlier/later than the eclipse date. The predication by general relativity is that light should be bent by 1.75 arc seconds for a light ray just grazing the sun. The deflection then falls off inversely with distance so that if the star were say just 2 solar radii away from the sun, then the deflection would be just half of 1.75 arc seconds. This is pretty darn small! He went over many of the details and corrections in order to be able to confirm the bending of light. We know you have to compare the positions of the stars near the sun with the predicted deflection when the sun is close by. But measuring the position of the stars to less than arc second accuracy is difficult. The one error source that I had not heard about was due to the gradient light from the corona. This light gradient is going to interfere with measuring the centroid of the star image. Since there is a little bit more corona light on the side nearest the sun than there is on he other side of the measured star, the measured estimate of the star centroid will have a tiny error. All of this effect, and the many other effects, have to be included in the measurement analysis. Pretty neat and thanks for that Richard! Next up was an interesting discussion of the AAVSO's year of activity by Director, Dr. Stella Kafka. She talked about the demographics of the AAVSO members and how it is really an international organization with members scattered around the world in almost every country. One slide of particular interest to me was how the members did their observing. 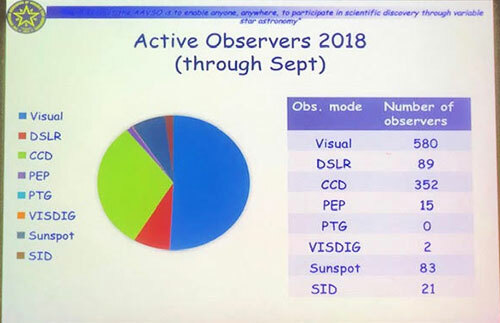 In the summary chart below you can see that the majority of members just use visual mode of determining magnitude and developing light curves for variable stars. The next most popular method was with a CCD camera and coming in third were those observers who just use a DSLR camera. Now, finally, I have found my entry into the field of variable star observing. I just don't want to have to set up the telescope and bring out a computer and do all of that effort just to make a variable star light curve measurement. Remember that by studying the light curve of variable stars tells us a lot about the underlying physics going on in the star. The AAVO offers many tutorials and observing guides so you don't have to be all alone when you discover how to make variable star observations and light curves. Now I see that there are many members who do it with just a DSLR and now I hope to be able to learn how to just grab my DSLR and tripod and go out an make a quick measurement. In fact our previous OCA Secretary, Bob Buchheim, received an award at the meeting for having just completed his 100th observation using a DSLR. Way to go, Bob! Ok, so as interesting as these presentations were, I gave into the impulse to play hooky and go off and explore the surrounding area with Resident Astronomer Peggy. 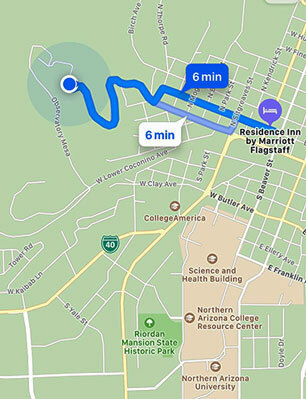 We both found the old downtown Flagstaff area to be a fun place to explore. 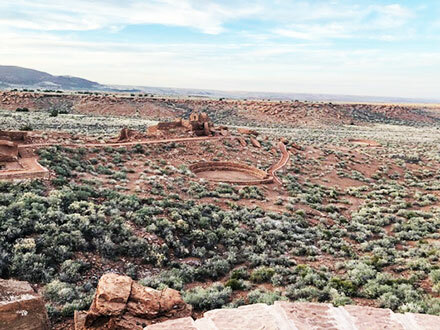 One of the areas within a hour drive of Flagstaff is the Wupatki National Monument and Sunset volcanic crater area, with hundreds of volcanic cones. The image below shows some of the ruins built by the Ancient Pueblo People somewhere around 500 AD and beyond. We also had more opportunities to see many instances of sundogs. The cold dry atmosphere in the area seems to make seeing sundogs very probable. 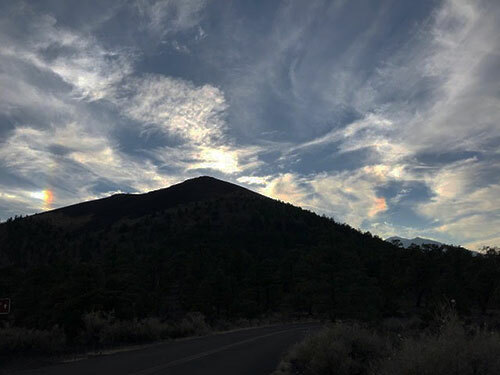 The image below has the sun conveniently position behind the volcanic peak, but two sundogs are visible on the left and right side of the peak. Also within about an hour drive to the south of Flagstaff is the exciting arts community of Sedona. The area is surrounded by magnificent rock formations. It is a very beautiful place and a real joy to just visit and drive to and from the area. Ok, hooky time is over and it is time to get back to Lowell Observatory for our night of observing there. After a quick stop at the hotel and grab some dinner, it is just a quick 6 minute drive up to Mars Hill and the observatory. From atop Mars Hill you can see the city of Flagstaff below. I had hoped to do some Milky Way observing from the observatory parking lot, but there were many much taller trees blocking my view from there. 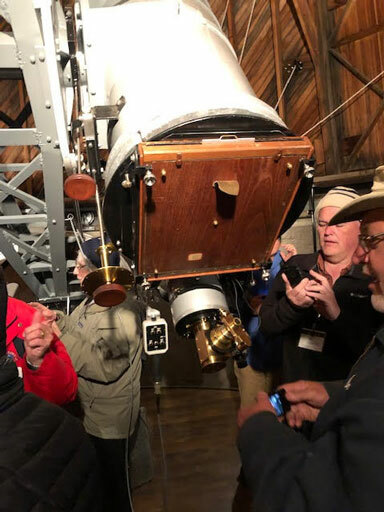 AAVSO had scheduled a private tour and observing session for all of us and we were able to see two of the historical telescopes that were some prominent in the observatory's past. First up was the Pluto Telescope, used by Clyde Tombaugh to discover Pluto in 1930. Initially, I thought we would be able to look through the telescope, but the telescope, really an astrograph, was designed not for visual observing, but just for taking photo images. After years of unsuccessful search by Lowell and associates (actually Lowell died in 1916 and the search started in 1909 was not successful), the job was given to the 23-year old Tombaugh. He took many hour long exposures on 14 x 17 inch glass plates and then compared images taken several days apart on a blink comparator. For each hour long exposure, he had to use a guide star and keep the telescope focused on the same part of the sky. Our docent, Jim, told us that on one occasion, Tombaugh in the dead of winter almost froze to death as his dedication kept him at the scope to finish a night of observing. Next up on our tour, after viewing the historic library in the rotunda, was the 24-inch refractor Clark Telescope. This telescope was built in 1896. 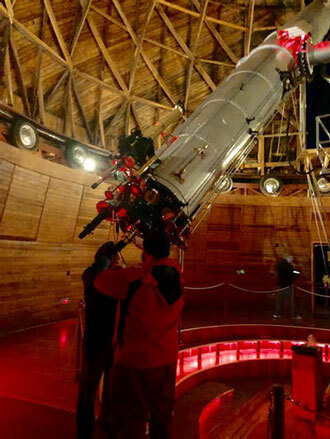 Inside the dome you can see the 24-inch Clark Telescope, which has a focal length of 32 feet. The photo below is taken with my iPhone and other images are better seen at the Lowell Observatory website. So, 30-40 of us stood in line in the cold, 30's temperature, for a chance to put our own eyeball next to the eyepiece. 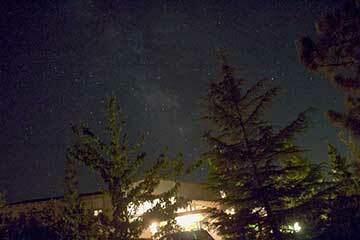 We had a chance to view Mars and M15. The clouds were starting to come back so many of us left at that time, but I understand that some stayed for a view of Neptune, which was really just a pale dot. So, that was our night there on the hill. You might be wondering about all the other telescopes that are part of the Lowell Observatory? Well, even though the observatory offices and support facilities are there the main research telescopes are now located on Anderson Mesa, about 12 miles southeast of Flagstaff. There are still three meter class scopes in operation there and that is also where the Navy Precision Optical Interferometer (NPOI), which was described in the previous post, is located. 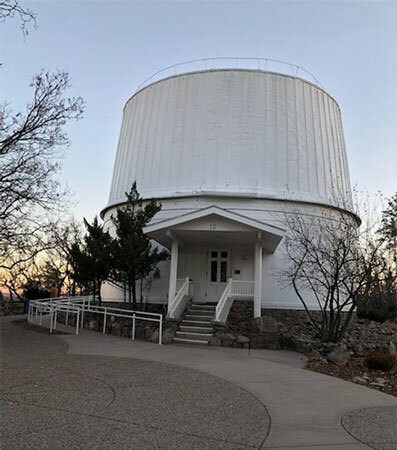 No tours were available at that site or at the other main Lowell site which includes the 4.3 meter Discovery Channel Telescope (DCT), which is located at Happy Jack, AZ. There is also the Naval Observatory Flagstaff Station nearby but they do not welcome unofficial visitors. They do have an annual open house, so maybe we should keep open to visiting that Arizona observatory too! One final point about Lowell Observatory. They had been instrumental in making maps of the moon in preparation for the manned Apollo landings on the moon. Also, I learned from our neighbor, Out Walking with Macallan, Ken, who had worked briefly with Bill Sinton at Lowell Observatory doing some lunar cooling measurements. Astronomers can determine the temperature of the planets and moons and even atmospheres by looking at the wavelength and intensity of light coming from the objects. Bill Sinton, who passed away in 2004, was an early pioneer in infrared planetary observations. Thanks for telling us that Bill Sinton story, Ken! 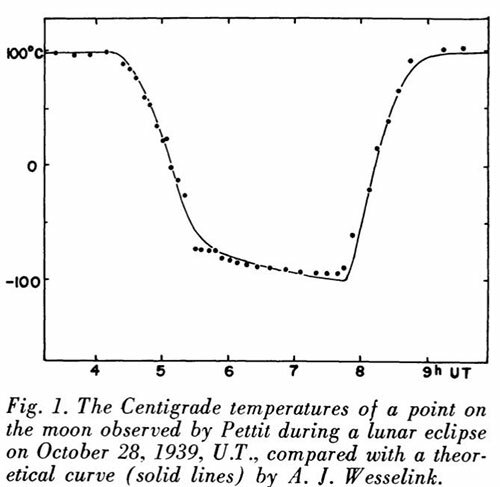 In the image, below, from one Bill Sinton paper I could find from 1958, you can see how the temperature of the lunar surface falls during a lunar eclipse. By making measurements of this kind one can learn a lot about the thermal characteristics of the planetary surface and atmosphere if there is on. You can see some of the thermal inertia effects of the lunar surface and how fast it cools off without the solar radiation. So in little more than an hour the lunar surface cooled from about 100 degrees C to -100 degrees C, mostly by radiation since the moon does not have an atmosphere. Ok, our visiting time at Lowell and the AAVSO meeting has come to an end. I had hoped to get some more images of the Milky Way while there, but the moon was almost full and the skies were just too bright and often partially cloudy. Such is the luck of the astronomer!